Though the directing duo of brothers Michael and Peter Spierig made one of the worst films of 2017 in what was the eighth Saw film it was hard not to hold out hope for what these guys might do outside the IP pool given Jigsaw was likely an opportunity they couldn't (financially) turn down. And so, in what feels like their true follow-up to their highly underrated and underseen 2014 time travel flick, Predestination, the brothers Spierig take on the real life mysteries likely still held within the walls of the winding Winchester mansion that is located in San Jose, California and was constantly under construction by the widowed Sarah Winchester for thirty-eight consecutive years until her death in 1922. Weird, right? Definitely. Couple this unique spin on the haunted house premise with the fact the Spierig's have somehow managed to attract the talents of rather pedigreed actors like Jason Clarke and the indelible Helen Mirren and one has to wonder what the attraction was. The Spierig's also reunite with Predestination star Sarah Snook here, but Snook is unfortunately underutilized as Mrs. Winchester's niece who has recently moved into the ever-growing mansion with her son after the death of her husband. This is all to say that Winchester has plenty of potential and while it never fully capitalizes on the ample opportunity it has to transcend the genre trappings and become something of a more self-conscious and timeless work it is a solid and sometimes even surprising haunted house tale that uses the audiences expectations to its advantage and takes certain elements in directions that feel fertile. The Spierig's screenplay, in collaboration with Tom Vaughan, relies too heavily on jump scares to garner the necessary reactions for being a member of the horror genre, but even still-they serve their purpose more often than not. Resorting to these easy, cheap scares feels a way of accounting for a requirement the Spierig's weren't really interested in though, as Winchester is seemingly more inclined to explore how cruelty, grief, and loss can affect people in different ways and to varying degrees. If the Spierig's had figured out a more inherently haunting way to convey their tone and the actions of those supposedly trapped souls in the rooms of the titular mansion this might have been a more convincing study on such topics, but as it is the film comes and goes with more simplicity than it does depth or scares. 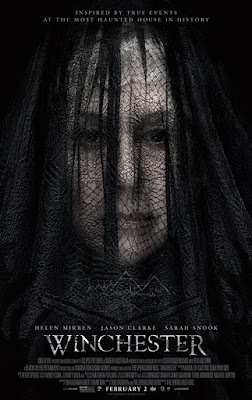 Helen Mirren is the widowed Sarah Winchester in this film about the Winchester Mystery House. Taking place over the course of eight days in April of 1906 we are first introduced to the aforementioned Snook character and her son who takes to wandering around the winding house in the middle of the night with eyes that look to be glazed over while on a mission intended to hurt himself in some manner. If at first this seems a default move for a scary movie to make in order to garner up a few jumps early on that is certainly what it feels like. Fortunately, these efforts are not done without reason as we are next introduced to Doctor Eric Price (Clarke) who, upon that introduction, is shown to have several demons of his own-getting high on his own supply, if you will-and therefore subject to all kinds of questionable decisions and hallucinations. It is somewhat surprising then when a lawyer from the Winchester Repeating Arms Company shows up at his door to offer him employment. It seems the board of Mrs. Winchester's late husband's company has decided she may be too mentally unstable to continue holding her place in the company. Being the biggest shareholder in the company has nothing to do with the additional $20 million Mrs. Winchester inherited after the death of her husband, mind you, but the boards concerns come to light a rather than investing in other outlets all of the money Mrs. Winchester makes from her firearms apparently goes back into her house so as to remedy the price she and her family had to pay for profiting from death in such a way. 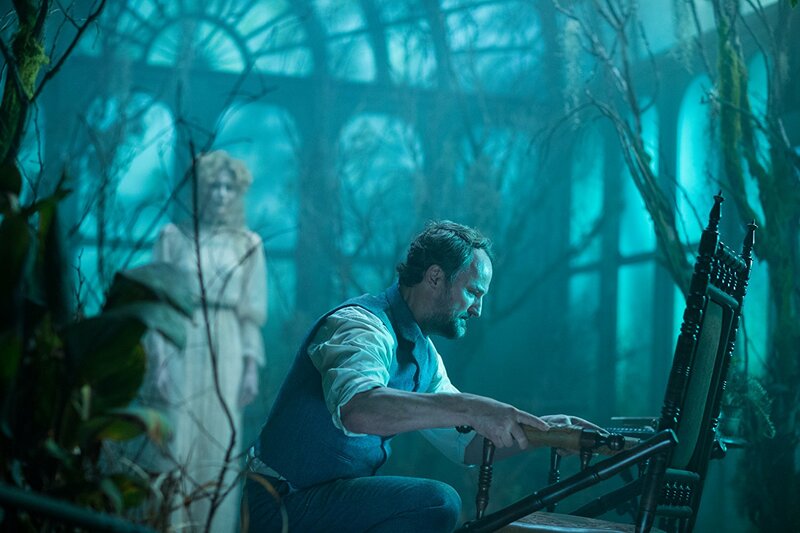 This is getting ahead of the film itself though, as Dr. Price, who was he himself hand-picked by Mrs. Winchester, is taken out to the Winchester mansion to observe and counsel the widow so as to make his own, professional assessment of the woman's mental state. Though the board members would immediately claim the woman is as mad as the house she's built Dr. Price isn't as quick to judge having had his own personal run-ins with death, loss, and the pain that follows a la the attempt to numb himself of any such emotions or memories. It is upon the meeting of Mrs. Winchester and Dr. Price where we see what Winchester might have had the chance to become did it not feel it had to adhere to a strict structure or the tropes of such a finite genre. It is said that after the death of her husband and young daughter, Mrs. Winchester turned to a medium who took advantage of her fragile mental state and convinced her she is cursed by the ghosts of those who died at the hands of Winchester firearms. One can imagine the discussions this might spurn between a woman with such strong convictions and a man of science such as Dr. Price. What is immediately striking about Winchester with the introduction of Mirren's presence into the mix is how assured this main character is in her belief as to what is happening around her balanced by her seeming understanding for how hard it would be to actually believe. As they are positioned in the story it would seem viewers are meant to assume Price is the protagonist as he is clearly the one the film is setting up to go through this transformative experience, but it is he who comes to represent more the other side of that coin once Mrs. Winchester enters the picture with her assuredness and the sympathy this quickly creates. The movie wants us to sympathize with Winchester as it becomes apparent she is more a victim of this image and mentality she must convey than she is an advocate for it. To this effect, it is Mirren's portrayal of this uneven and largely obligated state that guides the movie in more promising directions than even the Spierig's might deserve. 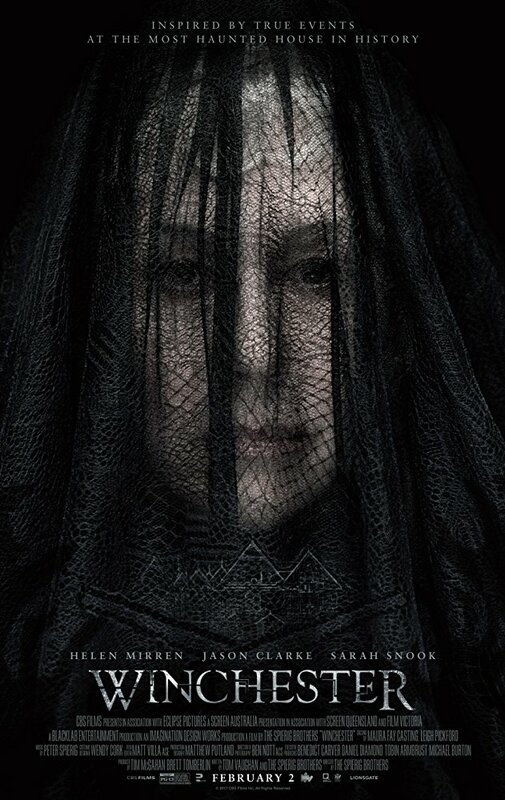 As Mirren's initially mysterious character comes to be more and more familiar throughout the course of the film and as the layers are slowly peeled back and the audience begins to better understand the dynamics and details of what the house represents and what Mrs. Winchester is dealing with the picture they paint is both simultaneously engaging and always on the edge of devolving into your standard "we must accomplish this singular thing to expel the spirits" climax that we've seen countless times before. And yeah, the last act kind of undoes all the great mythology that the film has built into the walls of the house in which it takes place with a resolution that is as anticlimactic and contrary to what it seemed to movie was actively preaching against up until that point that Winchester largely fails to succeed at what it wanted to accomplish, but it gets points for doing a few things right along the way. There is a message somewhere in here about what you think might be the end of you is what could eventually or ultimately save you, but this doesn't make a whole lot of sense given the events that unfold. Again though, this feels more due to the fact the Spierig's had to figure out how to stay within their genre lines rather than venturing into territory where they might allow Clarke's character to really figure out how he's going to cope with his backstory going forward and how the events documented in this film may or may not help him do so, but without venturing into spoiler territory, Winchester instead ends up essentially telling our supporting protagonist that comes to be Dr. Price that we all must learn to be at peace with our destiny otherwise we'll never have peace in our present-even if that means shooting a man who is haunting you because he's mad your guns are the ones that were used to shoot he and his brothers. Logical though, right? Dr. Eric Price (Jason Clarke) visits the Winchester Mansion to assess its owner, but encounters his own demons. Don't get me wrong, the screenplay tries its best to justify and bring meaning to this exchange, but it all feels muddled and unclear out of little more than the fact the explanation doesn't actually hold any weight. This may all sound more negative than what is intended though, as for the majority of the film it's not hard to acknowledge the strides that are being made to subvert both the haunted house film and the audience's expectations. Much of this begins in the casting of faces like Clarke and Mirren who are typically revered as being actors who star in serious dramatic material so as to be taken seriously themselves, but as of late Mirren has seemed open to more genre-friendly fare (she was in a Fast & the Furious movie last year, remember?) and to see the actress afford herself the chance to play as human a woman in the most supernatural and outlandish of circumstances strangely grounds these events in a manner where there is a balance of how frightening these spirits could have actually been made to be and how easy it might have been to laugh at the old kook. 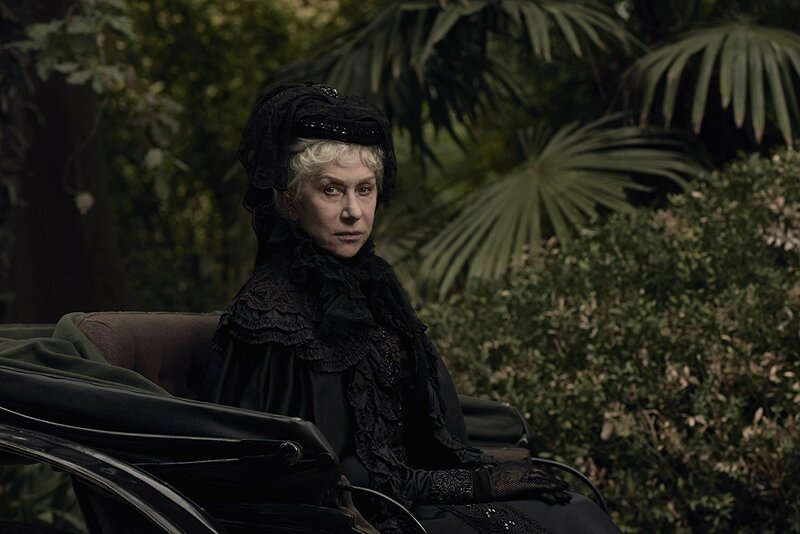 Rather, there is a trust in Mrs. Winchester's stories from the get-go as Mirren never allows the outer-image she projects as Winchester to account for much of how she is actually perceived. On the other side of the aforementioned coin, Clarke is one of these actors who has an interesting face and can carry the dramatic weight of the story in his expressions. In Winchester, Clarke's character is forced to come face to face with the moment that has left his life wracked with guilt and a burden he still carries and tries to numb by re-living what is undoubtedly the worst moment of his life in order to realize that he can't repeat this same mistake twice. It is another of these moments that are sprinkled throughout Winchester where we see real humanity-be it either through the performances or the uneven screenplay-that hints at what type of film this really wanted to be despite including and standing by the belief spirits and ghosts are real and many times truly demonizing in their ways. The Spierig's know they can't have their cake and eat it too it seems, but it would be fascinating to see this film through the eyes of a filmmaker who believed they could. The point being, Clarke gives an inspired and rather devastating performance in this instance that deserved not necessarily a different context, but a better conveyed context than he is given by the Spierig's. It's hard to say if Winchester then succeeds in actually saying much about grief and guilt, but it at least has a thorough story that is executed in a fashion that is respectable to the genre it feels it must remain within.